Get to know a solar-to-electricity system that isn’t stuck on the rooftop. Thus is s story about tenacity in renewable energy research and a long-range vision that might provide one solution to take on climate change using a network of solar roads, driveways, and sidewalks. 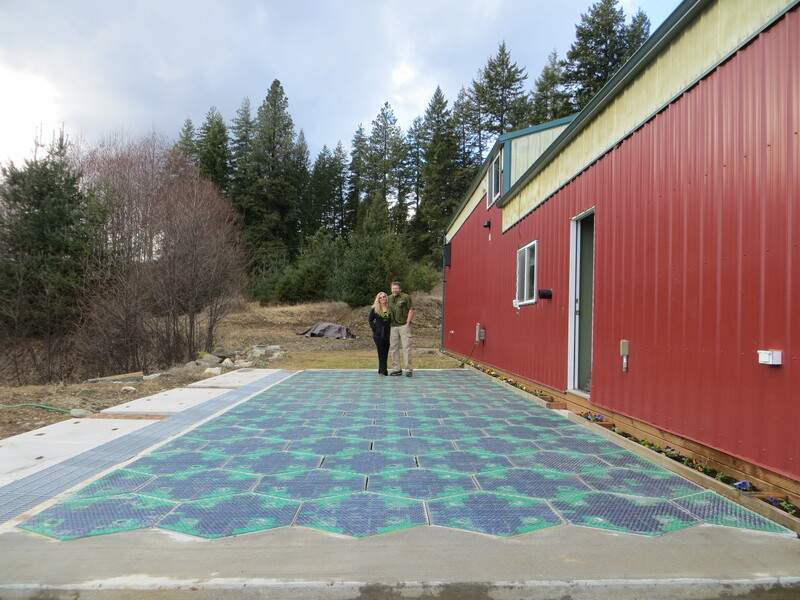 Meet Scott and Julie Brusaw, co-founders of Idaho-based Solar Roadways. Based on initial testing, this modular hexagonal PV paving system can withstand loads up to 250,000 pounds). The panels can be installed on roads, parking lots, driveways, sidewalks, bike paths, playgrounds, and pay for themselves through the generating electricity – ultimately enough to power connected homes or businesses. The panels can also be built with other features, including: a heating element similar to a car’s rear window defroster, keeping roadways snow/ice free at a 35-degree Fahrenheit temperature. Also, LEDs can be used to make road lines and signage, and an attached Cable Corridor can be used for power and data cables. EVs will be able to charge with energy from the sun (instead of fossil fuels) from parking lots and driveways and after a roadway system is in place, mutual induction technology will allow for charging while driving. Over the past four years Solar Roadways has generated a considerable amount of interest. Importantly, it received two phases of funding from the U.S. Federal Highway Administration for research and development of a paving system that will pay for itself over its lifespan. The Brusaws are about to wrap up our Phase II contract (to build a prototype parking lot) and now need to raise funding for production. This modular system that will modernize our aging infrastructure with an intelligent system that can become the new Smart Grid. To wit, the Brusaws won the Community Award of $50,000 by getting the most votes in GE’s Ecomagination Challenge for “Powering the Grid” in 2010. We had the most votes again in their 2011 Ecomagination Challenge for “Powering the Home”. The tough glass surface has been tested for traction, load testing, and impact resistance testing in civil engineering laboratories around the country, and exceeded all requirements. The Brusaws believe their panelized roads could produce more than three times the electricity consumed in the United States. The design is brilliant, simple, and promising. And not just for roadways. Think about the rooftop or the siding envelope. Cost has not yet been determined, says Brusaw, pointing out Solar Roadways is still in Phase II of its contract with the Federal Highway Administration. The final report is due in July. It is a long distance from R&D to reality, but the invention is brilliant, simple, and rich with possible applications. There have been abundant naysayers, as well. But a recent Indiegogo campaign targeting $1 million in development funding, has already raised over $2 million. “It’s been a very pleasant surprise,” Brusaw says, adding he is already collecting resumes and interviewing people. Positions this electrical engineers most needs: structural engineer, a civil engineer, a mechanical engineer, and a materials engineer. Here’s to a bright and high-energy future for all.